← Port Meadow strikes again! I HAVE GOT quite a lot of time for Susanna Pressel, Labour politician of this yard, let me tell you. Never lend her your secateurs though, if you want your cotoneasta to stay untrimmed. I understand she is a dab hand at pool, which she used to play at the currently closed The Kite, and deffo she is responsive to the locals when we ask her a question. She was, for example, a heroine in our campaign against The Wall between numbers 19-41 Mill Street. That is currently being pre-fabricated, much to the annoyance of badgers and other wild critters. 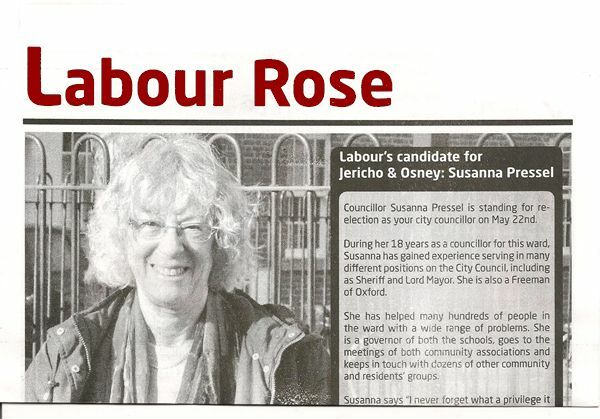 Pressel is up for re-election on the 22nd of May next, and as you can see from the blurb above, has quite a track record. I don’t know which two schools she is governor of, though but. There are certainly more than two schools in the Jericho and Osney ward. This entry was posted in Uncategorized and tagged colin cook, labour party, mill street, Oxford City Council, susanna pressel, the kite. Bookmark the permalink. She’s doll on many a leg of Aunt Sally, shorely..